Eivind Aarset is a guitarist with a unique musical vision that absorbs and reflects all manner of music while retaining an enviable individualism and high quality craftsmanship that can span from quiet intimacy to searing intensity. His debut as a bandleader on Jazzland Recordings was described by the New York Times as “One of the best post-Miles electric jazz albums,” setting a high benchmark that Aarset has consistently met and exceeded, both in the studio and in live performance. 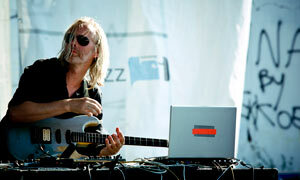 Eivind Aarset began his musical career as the guitarist of a heavy metal band. By now, Aarset took part in over 150 albums of different musicians like Ray Charles, Dee Dee Bridgewater, Ute Lemper, Ketil Bjørnstad, Mike Mainieri, Arild Andersen, Abraham Laboriel, Django Bates, Morten Harket and also Cher. Even though he mainly made a name of himself as a permanent member of the Nils Petter Molværs Band, which was the first to attract European attention with the sounds of the Norwegian jazz underground and whose albums he significantly influenced with his distinctive sound. Aarset combines exciting sounds of contemporary jazz with audacious improvisations and beats of European clubbing culture, which is why he is considered as one of the most individual and creative representatives of the Norwegian jazz scene. With enthralling and precise soundscapes the “Aarset sound” created an own niche in the inflationary overrun sound compositions of electronic jazz. →WROCŁAW – EUROPEJSKĄ STOLICĄ KULTURY 2016!!! 13.05.2011 | vernissage 5:30 p.m.
14.05.2011 | 11:00 a.m. – 1:00 p.m. / 2:00 p.m. – 4:00 p.m.
15.05.2011 | 11:00 a.m. – 1:00 p.m. / 2:00 p.m. – 4:00 p.m.
15.05.2011 | 1:00 p.m. – 3:00 p.m.
17.05.2011 | 10:00 a.m. – 5:00 p.m.